You’re reading this for two reasons. You know you need a new music product and are looking at us as a production team because of our quality and results, or you are a new artist (or starting again) and need someone to help you grow and develop the artist you feel called to be. Well, song development, music production, and design that competes with the Christian labels is our business. In doing this work for 20 years, we’ve worked with hundreds of artists, helped them grow, know the pitfalls and problems they’ve encountered, and have developed strategies and ideas to help them succeed. After all, the purpose of the recording is to extend the ministry you provide in concert. People will be further blessed and ministered to in their cars, at home, and anywhere they choose to listen. So, when we meet and work with Christian music artists, we don’t just set up microphones and say go. 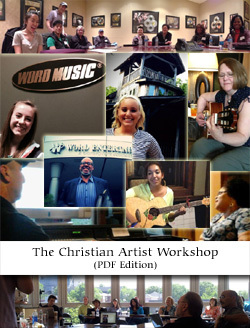 We help artists define their ministry. We work on songs with the artist to strengthen the message. We bring in the top Christian engineers, musicians, and singers whose talent will not only move you musically, but whose heart and personal testimony will give you new insight into your own ministry. We use our broad design and interactive experience to help give you a graphic identity that will complement and take your music farther. Most of all, at every lunch, every email, every phone conversation, there will be new information to share. From seminars to web sites, from contests to performance opportunities, from marketing successes to distribution possibilities. There’s always something new that another artist or experience brings to the table, that all our artists can benefit from. Creative Soul is more than just the music. Sure we can even provide you help developing great songs and arrangements, but our history in professional Christian recording projects has taught us how to best complete and promote a music product. We know how to design an attractive commercial design for your product. We work with incredible photographers, graphic artists, and web designers that give you results that get noticed by industry people, and your audience. We’ve been through the process of final mastering and duplication many, many times. We know our engineers, duplication reps, and production people as personal friends. Simply put, we’re not sure there is another company doing what we do from start to finish (if there is a finish), besides possibly a fully staffed record company. But here’s the part artists like most. After the recording is finished and the CDs have arrived, we’re still here for you. You have a partner in your ministry, and that is producer Eric Copeland and Creative Soul. How great is it, that you can stay connected with someone professional, and not be alone in your ministry? We’re proud to be a part of many ministries, and we’re happy to support and help develop those ministries through the years, instead of just cranking a product out and waving good-bye. So, that’s why Creative Soul is a little different than working just about anywhere else.